David Comes To Life has the feel of an epic, sweeping narrative. In contrast other punk albums I've listened to in my life, this newest entry by Fucked Up, probably Toronto's most notable punk 6-piece, feels as much like a piece of the oral tradition as anything. Broken into 4 movements, it may as well be a 4-act play, built around the high drama that punk usually trades in. Really, punk, for all its anger and hardness, is one of the most melodramatic music genres. Feelings here are massive. The guitars cry out vengefully at every moment of destruction and doubt. The vocals are raspy and frustrated. And the pace, accelerated as it should be, serves more as a set-piece (this story takes place in a high-speed, grinding world) to keep a story of love and loss, ennui and rebirth. All the while maintaining the tongue-in-cheek tone necessary to keep interest and prevent a slide into emo. Still, Fucked Up figures out a way to create a rock/punk-opera, in the vein of Tommy, but more brutally contemporary. It's streaming below. Give it a listen. Over 18 tracks, Fucked Up demonstrates incredible virtuosity with one perfectly crafted track after another. Sure, it's punk, but it's hook-heavy and catchy as hell no matter how you look at it. Each song serving as a short vignette that ties itself to the two songs around it. Conceptually, it's well-thought out, and in execution it is incredibly enjoyable. 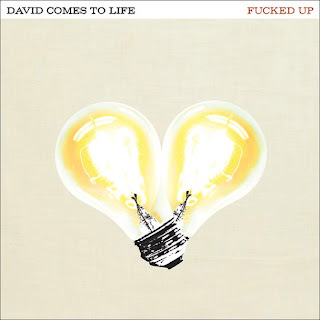 David Comes To Life rides a theme of "waiting for the other shoe," in a way that even as it appears outwardly tough (those raspy, potent vocals and crunchy guitars) it maintains a sense of constant vulnerability. This is a story of someone finally getting what he wants, fearing losing it, losing it, discovering the truth of why he lost it and then bouncing back. The perfect part is that for all that seriousness, implied and explicit, Fucked Up never loses sight of having fun. And in so doing, they maintain the punk ethos... anger, speed, hooks, distemper, etc. David Comes To Life feels complete. That's the most important thing. The story follows a strong, well-spelled-out arc and does so without ever compromising the band's musical wheelhouse. Fucked Up holds onto the abrasiveness we desire, demand and expect from punk music, and in the process produce a whole overflowing bushel of beauty too. Hearing this album isn't a unique experience necessarily, but it is a truly valuable one. And knowing that there was not one song on this album that DIDN'T grab my ears immediately, shake me about and take possession of my focus is accomplishment enough. Give it a listen. Even if punk isn't usually your thing, and it's definitely not every one's, this album will fulfill your desires. And if you don't like the raspy, guttural vocals, they become easy enough to drown out, leaving you awash in a sea of phenomenal progressions, licks and drum work. Podcast: It's A Thing! #10 - "For All The Lovers"